A sculptor sees the beautiful statue: the image of a Jesus, a Buddha, a Rama, a Krishna, or a Sai hidden in a boulder. All his effort is essentially to remove the obscuring rock and release the image that was all along within. The Lord himself is the Divine Sculptor. The world is the Sculptor’s studio; life and the experiences it affords are the tools used by the Divine Sculptor to chisel out the excess rock and release the divine image trapped in the human boulder. This is a story of such transformation from unhewn self to radiant self. This little book contains all the gems of the Universal Teachings of all the Ancient Masters of spiritual cultures past and present; that of Love , Inner-Peace and Brotherhood…a Birthright of all who manifest on this tiny Planet. It joins a long list of aspirants who have been touched by the life and teaching of the Indian Holy Man, Sri Sathya Sai Baba. Founder of The Hard Rock Cafe and The House of Blues; a devoted friend and follower of the teachings of Sai Baba for 40 years; who attributes his success in business to the values system he learned from this beloved Master. This book is a delightful two-part ride into deep space—spiritual space—in a cosmic chariot drawn by two quite different yet matching steeds. Part I, “The Journey Begins,” consists of Sarojini’s true life stories that help clear up why we’re all here. Part II, “Home Coming,” is husband Shyam’s learned probe into what here really means, and lays out the map for getting to it. As a student of Truth, the Director and Music Minister of a Center of Freedom, a non-denominational spiritual center in California, it gives me great pleasure to share what an illuminating book Faith, Hope and Love is. It speaks to the heart of everyone who is seeking to live from the Truth of Being. The journey that we all find ourselves on and the solutions to ‘keep on keeping on’ are perfectly met in the victory over the ‘little self’ each of these souls is humbly demonstrating. The principles of living a righteous and love-filled life and the full surrender that is called for each and every one of us is put in universal and understandable teachings. It is truly a Great Study in living the life we are all intended to live. Former Addictions counselor; Founder, Director and Music Minister of a Center of Freedom in, Martinez, California. Reflecting on their life experiences while integrating wisdom of diverse spiritual leaders, Sarojini and Shyam reveal their spiritual life journey. You will be inspired discovering their paths to understanding the universal divinity in each of us and their life purpose to love all and serve all. This powerful and ecumenical work will lead each reader toward the peace so badly needed in the world. The form of this book can be seen as a revival for the present age of the oldest form of recorded spiritual teachings. The contents of the book are an inspiration to any reader and cement the belief that Faith, Hope and Love are the foundations for the flowering of consciousness and unlock its mysteries. The book is a blend of personal experiences and the lessons learned presented in the simplest style to be understood by all. The authors take the reader to a higher dimension and each chapter in the book points to a state within us that is deeper and infinitely vaster than thoughts can transcend. A vibrantly alive love and peace is one of the characteristics of that dimension, so whenever you feel inner peace as you read, the book is doing its work in reminding you of who you are and pointing the way back home. I recommend this book to anyone who is earnestly seeking the Grace of the Lord to awaken the Sai, the Christ, the Buddha, the Krishna and the Prophet within each of us. Shyam and Sarojini bare their souls in this book, to share the spirituality in their hearts and the paths they traversed to grow spiritually. Many tales of discouragement and apparent defeat show the struggles they surmounted to develop higher spiritual qualities. They appear to be naturally serene and sublime individuals, while “Faith, Hope and Love” reveals the courage it took to overcome the obstacles in their spiritual path. They reveal how they learned to trust their inner guidance, stemming from their faith in their Spiritual Leader, Sathya Sai Baba. Many wonderful quotes and stories add to the inspiring personal stories. This is a spellbinding spiritual saga – a real page-turner. I couldn’t put it down – and I can’t wait to read it again. I am truly inspired. Works with the homeless, addicted and mentally ill; Active in the “Story Circle” – a discussion group at “The Bridge”, the new Dallas, Texas homeless center. Faith, Hope and Love… three simple words that are overlooked and lost in today’s clamorous world. These three ‘little’ words are much more than just words; they are a fortress with the tremendous ability to aid us in successfully navigating through this difficult life. Living proof of this is demonstrated throughout the material by Sarojini and Shyam. 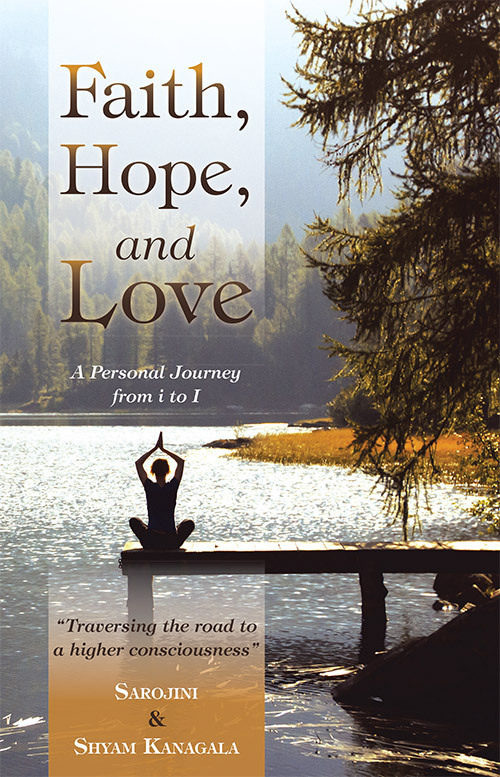 This book unequivocally inspires as it addresses all who are seeking to self-transform. It also beckons to those who cannot seem to find the strength to persevere in this trying time. Through the sharing of different lessons learnt by the authors this book truly provides an impetus to each reader’s search and will undoubtedly shine a powerful beam that illuminates their own individual journeys. We thank you in advance for your interest.